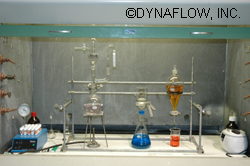 Chemical Analysis | Dynaflow, Inc.
Dynaflow has chemical and microbiology laboratories on-site. 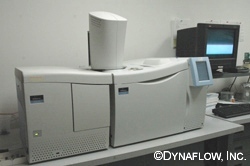 Analytical chemistry capabilities include trace organic analysis of water and air using gas chromatography (GC/FID and GC/PID) and mass spectroscopy (GC/MS with EI/CI/NCI). Several water quality analyses are also available including, pH, Total Organic Carbon (TOC), Chemical Oxygen Demand (COD), Biochemical Oxygen Demand (BOD), Total Phosphorus, Nitrate and Nitrite, Iron, Total Solids (TS), Total Suspended Solids (TSS), and Volatile Suspended Solids (VSS).